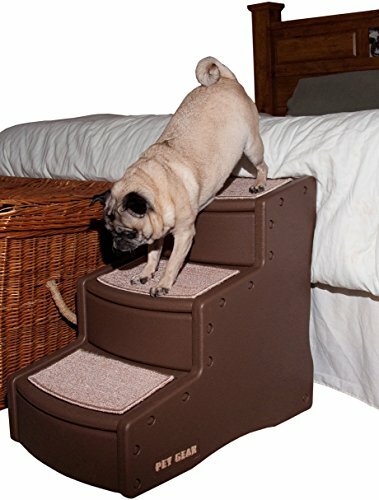 Pet steps have become very popular for pet owners that have aging or small dogs that may not be able to get on the bed or sofa. It provides a safe and easy way for them to get up and down without danger of falling off the bed. While a bed may not seem to be that high, for a tiny dog or an elderly dog, a fall from 2-3 feet off the ground can result in a bad injury. These top rated pet steps are customer favorites due to their design, popularity with their pets and ease of use. With all of the choices available on the market these days, sorting through them all can be very time consuming and even overwhelming. We’ve taken the guesswork out of the situation for you with these models. One may be just what you’re looking for. 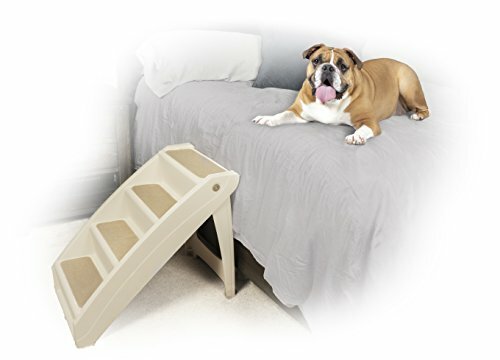 These top rated pet steps provide a safe and easy way for them to get up into their bed or resting place. There are many different designs available to choose from that can match your décor and preferences. In addition, we have provided a detailed buyer’s guide that will provide the information you need to choose the right set of pet steps for your pet. If you’re looking for a safe and easy way for your small dogs to get up onto the bed where they like to sleep, the Pet Gear Easy Step II Pet Stairs will do the trick. The wide, deep stairs have plenty of room for small dogs to get their whole body on each step and large dogs can easily climb them as well. The unique design of the step provides the right amount of incline to reduce the amount of steps needed which makes them easier for small dogs and older large dogs to use. Fewer steps mean less strain on the joints. Each step comes with a removable stair treat which is machine washable so they always stay clean. These Pet Gear Pet Steps are available in cocoa, tan, sage and chocolate to match any number of color schemes. Assembly is super easy, just snap them together. There’s no need for tools at all! The bottom has convenient rubber grips that make the steps even safer because they won’t slide when your dog uses them. The step will support dogs up to 150 pounds. 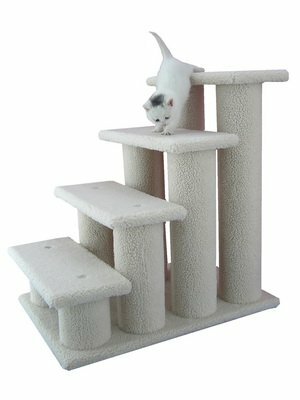 It’s the perfect choice for your pets to easily climb up where they want to go and you won’t have to worry about them falling. If you have a tall bed and a small dog this is the perfect solution to help your furry family member get onto the bed safely and quickly. The Solvit PupSTEP for pets Plus is a new version that is wider and taller than the original. This makes it the perfect step for dogs of all ages and sizes. It’s not only small dogs that can have trouble getting up onto a tall bed. Older dogs or dogs that have arthritis can also struggle. The Solvit PupSTEP gives them a way to safely get up AND down off the bed without danger of falling off and getting injured. The steps themselves only weigh 9 pounds but they can hold over200 pounds safely. You won’t have to worry about assembly, no assembly is required and they fold down for storage or if you’re traveling. The side rails add more security and safety and the non skid feet provides stability for your pet as they go up and down the steps. These steps also work great to help you dog get into a vehicle as well. The dimensions are 28”l x 18” w x 25” h.
Clean up is super easy, just use a mild cleaner to keep them looking good as new and to keep them sanitary as well. Another awesome factor about the Solvit PupSTEP is the lifetime warranty they provide against defects in workmanship or materials. It’s a great choice for any pet owner that wants to give their dog, large or small, the safe way to get onto places they may not physically be able to go. The covering on this set of Armarkat Pet Steps is made of soft faux fleece which makes it comfortable for cats and dogs to use to get up onto tall beds, sofas or even into vehicles. The soft ivory coloring goes with virtually any color scheme you may have in your home. These steps are constructed from pressed wood and have a maximum weight ability of 70 pounds so they are not a good choice if you have a very large dog. They’re perfect for toy to medium size dogs and cats of all ages and sizes. Assembly is easy and the Armarkat Pet Steps come with full, step by step instructions and the tools you need to assemble them as well. Dogs are typically the ones that most often use pet steps, but older cats or very small kittens can benefit from them as well. It’s a very good way to ensure the safety of your pets as they climb on and off a tall bed or sofa. Overall measurements for these pet steps are 25” Tall, 25” Deep and 17” Wide. No one wants to see their older pets struggle or injure themselves getting on and off the bed. These pet steps from Armarkat are the perfect solution that your pet will truly love. The soft, faux fleece covering is easy to walk on without slipping and will enable them to get on and off tall beds or sofas with ease and safety. These top rated pet steps are at the top of customers’ favorite lists because not only are they easy to put together, if they require assembly at all, but because they are sturdy, hold all sizes of dogs and cats and they provide a safe means of getting on and off the bed for their pets. Continue reading below to learn even more about choosing the perfect set of pet steps for your pet in our informative buyer’s guide. Pet steps are small sets of steps anywhere from 2-4 steps that enable a dog that is very small or one that may have arthritis or that is elderly to safely get onto tall beds or sofas or into vehicles. There are many different styles and sizes of pet steps so you can be confident in being able to find the set of pet steps that are the best for your pet’s needs. Animals love to be where their family is. If your dog loves to sleep on your bed at night but your bed is too high for them to get on and off of, your dog will more than likely require you to physically pick them up to help them on and off tall beds or sofas, which can be very disruptive when you are trying to sleep. Even if you have a large dog, there may be reasons for you to get a set of pet steps such as arthritis in the dog or they have simply gotten too old to be able to jump on and off the bed. Pet steps are a safe way for your dog to remain with you without having to be picked up. This is very convenient, especially if the dog needs water during the night or needs to go out and use the bathroom. Having a reliable set of pet steps ensures that your very small dog or older dog doesn’t get injured by falling off the bed when they try to get on or off of it. It’s also great for getting into vehicles as well which can be difficult for a small dog or older dog. There are several features that you want to look for when you research the different styles and models of pet steps available. We have outlined them below so you know exactly what pet steps are good choices and which ones would end up being a waste of your money. Wide Steps – Wider steps are more stable and will not typically tip over as your dog goes up and down. There are many models of pet steps that have very wide steps which are much easier for the dogs to climb up and down. Some even have specific inclines that enable there to be fewer steps to achieve the same distance. A narrow set of steps may look cute, but if your dog tips them over or slips off trying to use them, not only can they get hurt; they won’t want to use them anymore. Non-Skid Surfaces – Most pet steps have some kind of no slip surface on the tread of each step. Some might have faux fleece, others may use carpet treads. As long as there is something on the stair tread to prevent the dog from slipping you will be protecting them from falls. Good Weight Load Capability – This is especially important if your larger dogs will be using the pet steps to get on and off the bed. Some of the models can accommodate over 200 pounds with no problem. If you have a tiny dog, having a high max load is not as important so take your own needs and the size of your pets into consideration. Easily Set Up – No one wants to struggle with assembling anything, let alone pet steps. Fortunately most pet steps are either already assembled or assembly is very easy and everything you need including instructions and tools are already included. Some models even fold up which makes them a great choice if you travel often. With all of the designs that are available finding one to suit your specific needs isn’t too hard at all. Not too Heavy – Even though you want your pet steps to handle a heavy load, you don’t want them to be heavy to move around. When your dog needs the pet steps to get up onto beds, into vehicles or onto sofas, you may have to move the steps around. One of the top rated steps we reviewed above can handle over 200 pounds of weight but only weighs 9 pounds! So it is possible to find models that are not too heavy while still supporting a good amount of weight. Taking care of your pet steps is really very simple and doesn’t involve any special chemicals. Regular household cleaners work just fine. Many pet steps have removable treat covers, some of which are machine washable. For the faux fleece covered styles, they will be harder to clean and could involve something a little stronger. Many people opt not to get this style for that reason. There are an abundance of colors and styles of pet stairs for you to choose from. Many pet owners opt or neutral colors, but some models have colors like chocolate, sage green and others, making it possible to match your bedroom or living room décor much better. If you want a specific color scheme, be sure to look around at the models that appeal to you to see what options they offer. Dogs don’t always know how to use pet steps so it’s important to take the time to teach them what they are for and how to use them. They might be a little fearful at first, so make sure that you only use positive reinforcement to teach them. One of the most effective ways to teach your dog to use the pet steps to get on and off the bed or sofa is with a treat the dog really loves. If they are afraid to approach the steps at first, call them over to the steps and give them a tiny piece of the treat if they listen. Continue with this method one step at a time until they are on the bed where they earn tons of praise and more treats. Getting off the bed is a bit more difficult, so be patient and don’t expect them to learn to navigate the steps all at once. Some dogs will pick it up right away and others will need more patience and coaxing, but stick with it and in no time your dog will be flying up and down the pet steps in seconds. It’s important to ensure that the steps you choose have rubber stoppers or feet on the bottom so the stairs don’t slide while the dog is trying to go up and down them. If the steps slip while the dog is on them and that causes them to fall or almost fall, they will be far less likely to try again. You want to make sure that the pet steps you choose are the right height for what you need them for, so measuring is a must. Measuring the height of the items you want to put the steps in front of will ensure that you get the right size that will make it easy for your small or elderly dog to get onto. All pet steps will have their dimensions, so once you know how tall you need the steps to be, you can rule out any that don’t meet your needs. With the invention of these practical and unique pet steps, your dog no longer has to suffer, hurt themselves trying to climb beds and sofas that are too tall, or be alone when they’d rather be with you. Pet steps have a lot of uses and once they get used to them, all dogs love to use them to get up onto tall beds, sofas, into cars and even to just look out the window without having to deal with pain from arthritis, aging or just simply being too small. With the information that you have gotten in this buyer’s guide you are ready to look for the right set of pet steps for your dog or dogs so they can still sleep where they are happiest…with you. You will find that there are tons of styles and sizes to fit all types of needs. There are even pet steps for pet owners that travel a lot with their pets.